When Upon arrival you will find Egypt Tour Packages representative by Egypttravelcccc tours for meet & assist service through the arrival formalities, then you will be transferred to you hotel by A/C car. Overnight at Cairo and start your Egypt Travel Tour Package. • Then precede to Sphinx the mysterious monument which has human face and lion’s body. Transfers to the train station for your overnight Sleeper train to Luxor – Dinner on the train. Afternoon tea, Dinner on board & Belly Dance show. Lunch on board. Sail to Esna – Afternoon Tea – Disco Party. Breakfast on board. Visit the Temple of Horus in Edfu – Sail to Kom Ombo. Lunch on board. Visit The Temple Shared by the Two Gods Sobek & Haroeies in Kom Ombo. Afternoon Tea – Dinner on board & Galabeya party. • Sail on the Nile by felucca around Kitchener’s island and Agha Khan Mausoleum. Afternoon Tea – Dinner on board. Breakfast on board – Disembarkation, Transfer to the train station for your overnight sleeper train to Cairo – Dinner on the train. • Then visit Pompay’s Pillar. • Followed by visit to the Catacomb of Kom El-Shoqafa. • Followed by Visits to & Also from outside you will Visit Qaitbay Citadel & El Mursi Abu El-Abbas. Breakfast, then transfer to Cairo by A/C car. Arrival, meet and assist by our representatives. Transfer to your hotel. • 1 Night hotel accommodation in Alexandria on B&B basis. 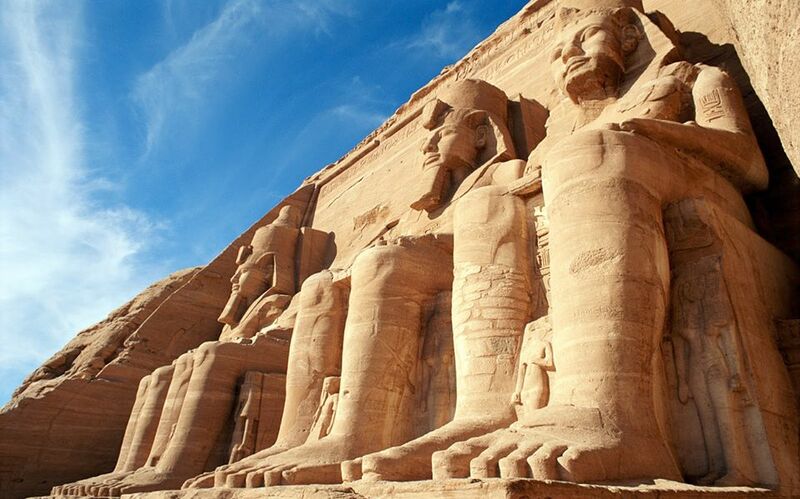 • 4 Nights on Cruise board (Luxor & Aswan) F.B (sightseeing included). • 2 Nights on sleeper train board, dinner and breakfast included. • 1 Day tour in Cairo visiting the Pyramids, Sphinx, Egyptian Museum and Khan El Khalili. • 1 Day tour in Alexandria visiting, Pompay’s Pillar Catacomb of Kom El-Shoqafa. • All transfers in Cairo, Alexandria, Luxor and Aswan. • Transfer by A/C Car: Cairo / Alexandria – Alexandria / Cairo. • Any item not mentioned. Riding camel and horse around the Giza desert pyramids .